We are pleased to announce the launch this week of the ICH Medical App Library; a free app for smartphones and tablets that delivers an up to date and growing list of trusted and relevant medical apps and mobile resources right at your fingertips. Currently only available on Android devices. Click below to download from Google Play or speak to a member of staff. The library is no longer available to offer binding facilities. We are pleased to announce that the Library was awarded a SILVER at the UCL Green Impact Awards Ceremony which took place on 10th June. 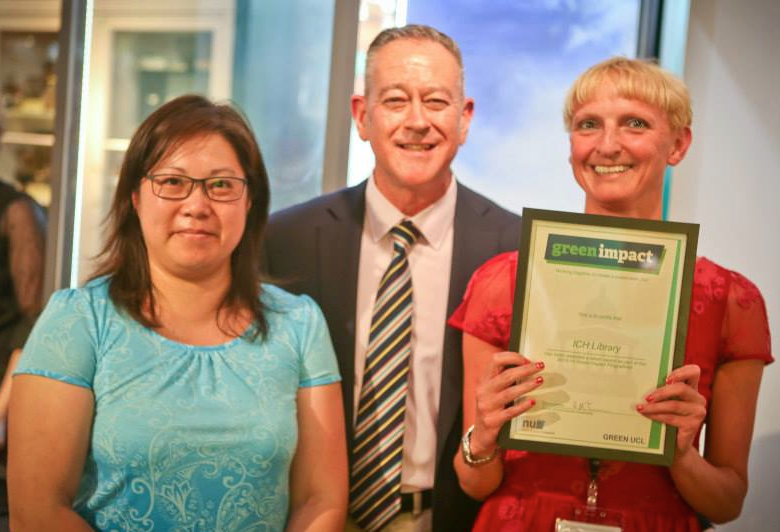 Green Impact is an annual programme that empowers staff and students to improve their departments’ environmental performance and boost the sustainability literacy of peers and colleagues. 32 teams received awards at the ceremony at the Grant Museum of Zoology.